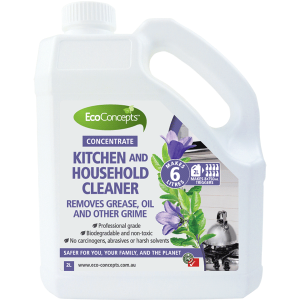 EcoConcepts Kitchen and Household Cleaner is a hard-working, all-purpose cleaner certified for safer use. 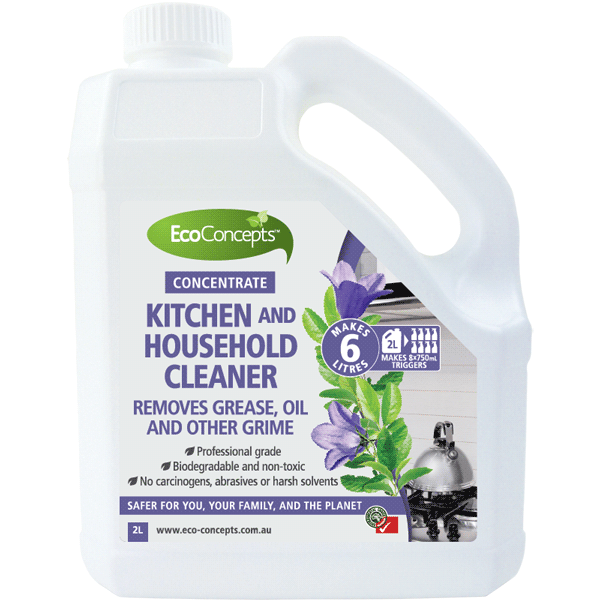 It is a highly-effective cleaner and degreaser, perfect for kitchens and around the home. 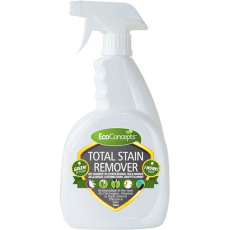 Its powerful cleaning action removes grease, oil, and heavy soiling from hard surfaces such as bench-tops, tables, doors and walls, with no rinsing required. Safer to use on plastic, ceramic, rubber, glass, stainless steel, enamel, concrete, vinyl, terrazzo, quarry tile, Formica, and painted, varnished and other surfaces. I’m a concentrate and nearly ready for use. Pour 250mL into a 750mL trigger bottle and fill with water. Spray diluted product and wipe off – no rinsing required. Test in an inconspicuous area first.